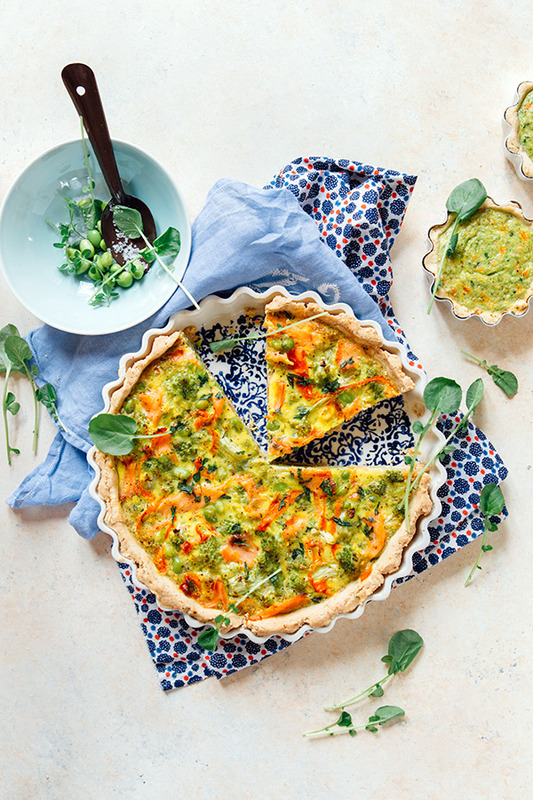 A number of you inquired about this vegetable tart. So I am quickly stopping by this morning before Rémy wakes up to share the recipe. Right now, the drawer of my fridge is filled with heads of Romanesco because I am always aware of how short the season for this lovable vegetable is. This is one of the reasons why I had the idea for this tart. Should you not be able to find Romanesco (irresistible…. ), I am sure cauliflower or broccoli would be great options too. But eh, Romanesco really rocks! Preheat the oven to 375 F (190 C) and roll the crust. Garnish your tart mold with it. Make small holes with a fork at the bottom; set aside in the fridge. Blanch the romanesco for 4 minutes in salted water. Strain and keep on the side. Blanch the edamame for 1 minute. Transfer to an ice water bath. Heat 1 tablespoon olive oil in a frying pan and add the carrots. Cook for 1 minute and add the garlic, romanesco and edamame. Cook for 2 to 3 minutes. Season with salt and pepper. In a bowl, beat the eggs with the heavy cream. Add the chopped herbs, Comté cheese, and hazelnut meal. Pour the egg batter over the crust and arrange the vegetables on top. Add the smoked salmon and a dash of red peppercorns. Bake the tart for 40 to 45 minutes, or until lightly golden on top. Remove from the oven and let cool for 5 minutes before slicing. Serve with a side salad. Note: If you have leftovers crust and prepared vegetables (I did), purée together romanesco with carrots, and add chopped parsley and grated cheese. Add 1 beaten egg and 2 tablespoons heavy cream. Use this batter as the topping for tartlets (enough for 3 or 4, depending on mold size) to be enjoyed by children. Lulu and Rémy loved these….OR make a larger tart, like an 11-inch (28 cm) tart. Seeing as I love all the ingredients in this tart, this is one I will be making very soon and before the romanescos disappear from the market. Did you use a pâte briseé? Thank you for getting up early and sharing this elegant recipe. I have missed your posts. Great idea for using romanesco in a beautiful and creative way! I love the use of smoked salmon in this. After reading about the other tart (and having Romanesco and Edamame already in the fridge) I just kind of fudged it, using the other recipe as a basis – and it came out pretty well! Didn’t think of using carrot, I thought the photo showed smoked salmon. I think I’d use those lovely rainbow carrots next time.Where can you get Comte cheese locally? Does Whole Foods carry it? What a lovely and delicious looking tart! 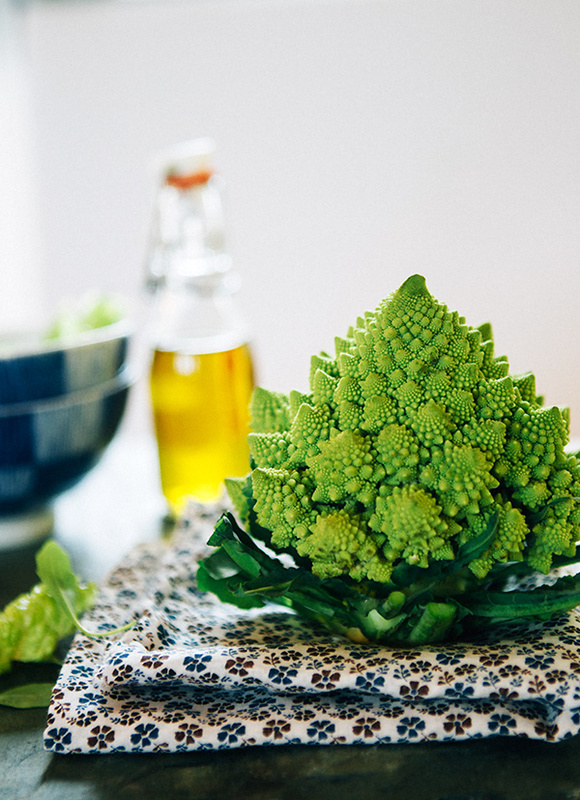 Romanesco is truly a marvel of nature, just so beautiful. Love the flavors of this tart. Thanks for solving my dinner dilemma! Just made it for dinner. I did not have edamame so used mushrooms instead. It was absolutely delicious. I highly recommend it. I wanted to try this tart. Thanks a lot for the feedback and link to tart Nadia. Love that you tried and enjoyed it! When i am looking a food like this i can,t wait to eat it,s looking absolutely delicious. What a fabulous recipe and delicious recipe book.. I’ll keep my eye out for it! The mango in this flips my switch! Delicious share Heidi! Thank you!